Authors: Pawel Plaszczak Richard Wellner, Jr. 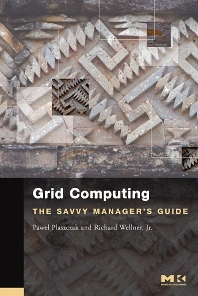 Grid Computing: The Savvy Manager's Guide examines the technology from a rigorous business perspective, equipping you with the practical knowledge you need to assess your options and determine what grid computing approach is right for your enterprise. This book is heavy on real-world experience, distilling from a rich assortment of case studies the best practices currently at work in a variety of industries. Always attentive to grid computing’s many competitive advantages, it is also realistic about the challenges of selling the idea to staff and making it a part of your company’s culture. Sketches the history of grid computing, showing how it made the leap from academia to business. Examines the criteria you'll need to meet to make your network "grid-enabled." Explains how a grid-based solution can be made to meet key organizational requirements, including security, scheduling, data storage, and fault-tolerance. Surveys the approaches currently available and helps you choose the one that will best meet your needs, both now and in the future. Focuses heavily on the competitive advantages you can reap from grid computing, and provides advice on convincing your organization to adopt grid computing and making a successful transition.